(For information on specific compost to grow plants click here). Compost gardening deals with recycling organic matter to make good soil. By compost gardening all your organic matter becomes a harvest. Just like you would harvest flowers, fruit and vegetables to eat and enjoy, so garden or domestic organic matter is harvested to improve fertility and condition of the soil. Soil organic matter is vital for success with plants. So link into your garden nutrient cycle by conserving existing nutrients, gain access to unavailable nutrients and re-use materials that you throw away. The benefits include a tidy, healthy garden and cost savings. Nutrients are held better when in organic form and by compost gardening you increase nutrient rich soil organic matter. You will collect organic materials from a variety of sources to make a variety of useful feeds and conditioners - garden compost, worm casts, liquid feeds, mulches... The microorganisms so important in releasing nutrients to plant roots thrive because compost gardening feeds them. Convert free nitrogen in air to organic soil nitrogen. Grow green manures of Pea/Bean family to fill spaces & dig in to increase soil nitrogen. Grow Clovers around your Comfrey patch to increase soil nitrogen. Comfrey has deep roots to absorb potassium that’s otherwise unavailable to plants. Deep rooted plant that accumulates Calcium. Grow as a green manure. Fat Hen and Purslane are weeds that are noted for accumulating Calcium, Phosphorus, Potassium, and Sulphur. Other weeds do similar. Dig in or Compost Weeds the mineral content is usefully incorporated into organic form. Find more about space-age compost bins. Reduces loss of available Calcium. Leaves may be composted separately, or added to garden compost. Top dress shrubs, fruit and perennials with compost to replace lost Calcium. If you apply a fertilizer like Rooster U.K. or Summer or Autumn Lawns Alive U.S.A. to your grass then you can re-use the nutrients when you cut the grass. Collecting and removing grass cuttings will drain fertilizer nutrients from the turf. But at least they can be re-used elsewhere. Don’t throw away lawn cuttings. Old meadows that haven’t been fertilized can be nutrient rich compared to improved grass. I find the cuttings heat up quickly and produce a much stronger smell. Small herbs like medic, clover, prunnella, dandelion and daisy may be helping to fix nitrogen or activating the compost. A mulch mower finely shreds cuttings and injects them back into the turf. Do this in spring and every alternate cut in summer. Mix in with dry stored leaves to make garden compost. Try sowing grass seed mixed with the seed of nitrogen fixing clover, and medics. About how composting works. If you’ve spent money on fertilizers you can reclaim some nutrients by putting old plants on the compost heap. Apply garden compost and use less fertilizer next time. Soft kitchen waste - tea bags, coffee grinds, soaked cereal, unwanted cooked potato or rice, paper towels, vacuum cleaner dust can be added to a worm composter. Worm casts are especially rich in humus, nitrogen and phosphorus and useful microorganisms. 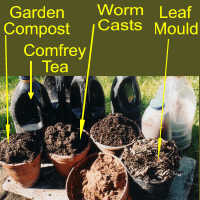 Add worm casts to plant containers, seed drills and composts to help retain moisture and stimulate root growth. Apply liquid from your worm composter to feed plants. Industry generates waste which can sometimes be freely aquired e.g. horse manure. The compost gardening approach recognises that building organic matter is the best way to good and healthy flowers, fruit, veg etc... By compost gardening you link your garden to sustainable nutrient cycles and make new organic matter in your garden. Find out about materials you can recycle and how to use them in compost gardening.